The flood waters receded about 5 days later. We found out that the community well was wiped out in the flood. The Grays river jumped its banks and spread out about 2 miles wide. When the river sought a new route it stranded a family with a new baby. The coast guard came in and rescued them. The coast guard originally told the family they could only take needed essentials, they would have to leave their dogs. The owners refused to do this so their dogs were rescued with them. The river split and went to both sides of the house leaving the house and a small part of the yard above water. The reason this happened may boggle your mind. The story starts several years before. 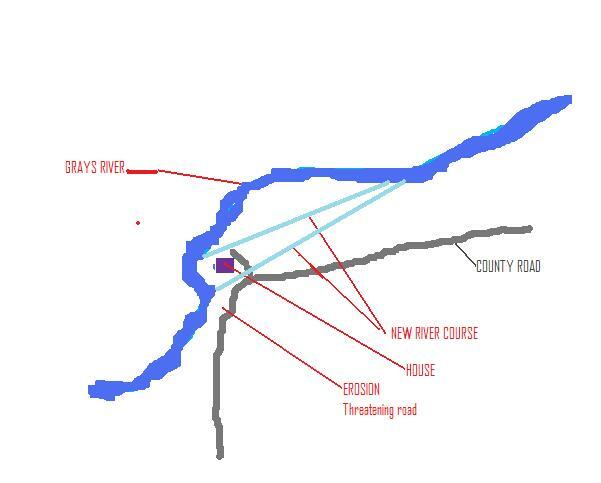 The Grays river(see crude diagram)had been eroding the bank of a curve just passed the house. The community got together with all of the appropriate organizations to fix the eroding bank. They lined up the excavator the rip-rap gravel.The people the permits and all. The day they were set to fix the bank. The equipment was delivered the trucks waiting with the gravel. They were set to start working just waiting for the army corp guy to show withe permit so they could get started. Disbelief on everyone’s mind, they shut it down. That night the rains came in a torrential down pour. All night long. The water saturated ground just poured the water down to the lowland and into the river. The grays swelled, and jumped it;s banks. Taking out the community well and surrounding the family in their house. A Coast guard evacuation required and a community with no drinkable water. Sound like Katrina. Jump forward 9 years to a devastating hurricane on the gulf. The major flooding to the worst areas in New Orléans, were flooded by the dyke failing on Lake Pontchartrain 17th Street Canal levee and the London Avenue Canal. The storm surge did it’s damage but the dyke breaking allowed the lake to enter neighborhood in New Orléans. You know the story people stranded on top of house needing evacuation by the Coast guard and other emergency personnel. What was never revealed in the mainstream media was years before Permits were submitted by the army corps of Engineers to the EPA. The EPA sent them back telling them that the I” were not dotted and the T’s were not crossed. Army corps needed to do this and then resubmit the permits. They never resubmitted the permit. The money was acquired for the project to shore up the dykes but were never done. Previous postWater birth and dealing with floods…….